Thanks to watches, checking for the time while on the go is as simple as glancing at your wrist. These days, watches are one of the most practical gifts you can give a modern man. It’s a stylish accessory that can complement any outfit depending on its design, and it serves a utilitarian purpose unlike other accessories. If you want to get the most out of your watch, though, I recommend avoiding the cheap watches and investing in high-quality watches that offer many features. Sure, a $3 dollar watch is cheaper than buying a $200 watch, but only if you look at it in a short-term situation. A cheap watch may promise a battery that theoretically lasts for years, but the wear and tear of everyday use can make its lifespan shrink – and the low-quality materials will do little to protect your watch. By the time eight or nine years pass, you might have saved more money investing in a quality watch than having to buy multiple cheap watches because they kept getting destroyed easily. The watch I own has lasted for over eight years and is still in good condition. Now, I plan to buy another one to get a more updated design. Whenever I’m looking for watches for myself or as a gift to others, I take a lot of factors into consideration: the design, the brand, the price and warranty, and the add-ons. One feature I make sure is present in the watches I buy is the waterproof feature. 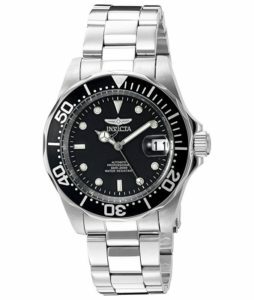 Even though I and the men I’ve bought watches for aren’t the adventurous type and are unlikely to go swimming or snorkeling outside of the summer season, a quality waterproof men’s watch ensures that the watch is durable and can withstand liquid wear and tear such as sweat, rain water, humidity, or even sudden splashes. Watch manufacturers cannot guarantee a totally waterproof watch because some of the inner mechanisms may damage from water exposure, but a high-quality waterproof watch can keep water out to a certain extent. With more developed technology coming out every year, if you’re looking to make the most out of your money when investing in men’s waterproof watches, you’ll want to buy the models created more recently. If you’re interested in water-resistant watches, consider buying these pieces. Fossil Men’s Machine Chronograph may turn out to be a waterproof watch for you if you are tired of taking off your watch every time you take a dip in the water. It has a 50M of water resistance, which means its materials can withstand the water pressure you’d experience if you swam 50 meters or 165 feet underwater. It has a great stylish design available in eight colors. It has a 42mm blackish stainless-steel casewith a textured black bezel and a textured crown. Its 22mm strap is also made of stainless steel and is compatible with other straps of the same size. It has a black dial and also has a date window along with three sub-dials. 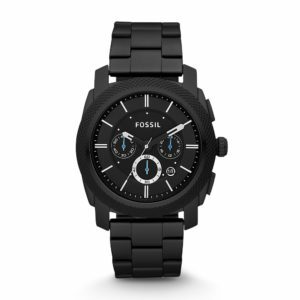 You can have your watch engraved for free if you buy it from Fossil’s online store. Stainless steel doesn’t corrode, rust, or stain as ordinary steel would. Its eight colors come with the option to remove the sub-dials, if you don’t want these features. 5 ATM is relatively low in terms of water resistance level. It’s not ideal for adventurous divers. Repairs and product replacements would have to fall within the two-year limited warranty. There is no luminescent option, meaning it may be difficult to tell time in the dark. 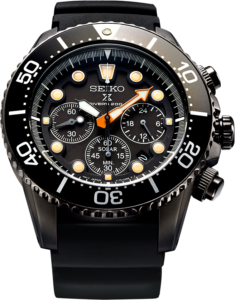 Since 1965, Seiko has been producing diver’s watches catered to the adventurous open water explorers. Ever since, their line of watches have been used by divers in groundbreaking dives, capable of withstanding such extreme lengths under the sea. The best part about this time piece is that it is water-resistant to 200M which clearly means it is great for recreational scuba diving. Moreover, the Seiko Diver’s watch is very stylish as well. It has a black dial and stainless steel case which is 42mm and luminescent hands and markers. It has a high quality Japanese automatic movement and this makes sure the watch keeps ticking without the need of a battery. Being one of the oldest watches brand, Seiko has been creating quality watches since the past 125 years. By inventing the first quartz wristwatch, Seiko has changed the entire history of watches. 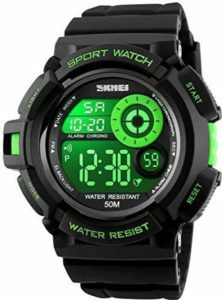 This waterproof watch has high quality quartz movement which keeps accurate timings. The dial is easily visible in the dark. The strap of the watch is also high in quality and feels very comfortable on the wrist. Extremely high-quality watch well-suited for divers and people with active lifestyles. Additional sub-dials and other features available, depending on the style you choose. Bulky hands look a bit out-of-place from its sleek and stylish design. The entire series generally looks the same, apart from its color difference. 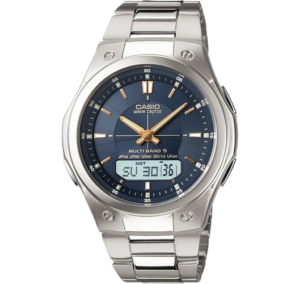 Casio is one of the best brands for time pieces and has cemented itself to be the most durable and tough among the other watch brands. Its Wave Ceptor series features a line of waterproof watches available in various digital and analogue designs. Its 100M water resistance means that while you can’t take it with you scuba diving, it’s great for casual swimmers or people who expect to get splashed every now and then. It has a wide array of designs, not simply just the same build but different colors. Every watch in the series has a Tough Solar Power feature that ensures stable operations. The series has Atomic Timekeeping, which automatically calibrates the time when you’re travelling internationally. Some of the designs were based on watches outside the Wave Ceptor series, so it may easily be mistaken for similar-looking Casio brands. While there are many watch designs, the digital watch’s screen designs are roughly the same. 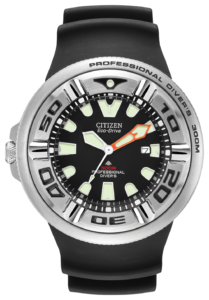 The Citizen Eco-Dive Professional Diver Watch has an elegant face with a classic design. It is the first light-powered, saturation-diving watch built to withstand water pressure of up to a thousand meters deep. It has a crystal face made of sapphire glass which absorbs the light and transforms it into energy source for the watch. The case is made of titanium and its solid and durable and incredibly waterproof which is a great watch for snorkeling when you go deep down. Its saturation-diving feature prevents helium from penetrating the watch while underwater and causing internal damage or leakage. Testing by the Japan Agency for Marine-Earth Science and Technology shows that it is durable even for water pressures beyond 1000m. Luminescent features make it easy to read in the dark. Three out of four of its designs look rather bulky. These wouldn’t look good at a professional job or for everyday use. For its price and appearance, it’s not something you want to buy for yourself or another person unless that person is really serious about diving. Invicta’s 8926 Pro Diver Collection Automatic Watch is a super stylish water-resistant watch. It features 200m of water resistance and possesses a 40mm, round, silverfish, stainless steel case and rotating, unidirectional bezel with silver tone markers. Apart from its sleek appearance, it has a black dial with luminous hours and marker hands trimmed in silver tone. Similar models are available featuring different styles. Its designs look good for everyday use. Its components are outsourced from Japan. While its case and bezel are made of stainless steel, its metal dial may be prone to rusting. Its buckle and clasp are very basic and may be worn out over time. Fanmis Military Digital Watch has a silicone rubber band which turns out to be super comfortable on the wrist and will also last a long time. Its casing is also made from silicone rubber which is great in terms of protecting the watch and keeping it water resistant. This watch has and LED backlight and comes in 7 cool colors to choose from. Even though the design is a little bulky, it is very simple and elegant at the same time. You can see the time in 12-hour and 24-hour format as per your choice. Day, month and year can also be displayed easily. One great feature is that it has a built-in compass that help you get your bearings in the water as well as out of it. The watch lasts for a pretty good time and its battery gives three years of life. It has a 7-color LED backlight. Choose from any color that suits your style. Has a water-resistance level of 50M. Multi-functional purpose as a calendar, stopwatch, and alarm. The compass window is only a decoration. Does not come in an analogue design. Timex is a classic and well-known brand but still provides relatively affordable but quality watches. 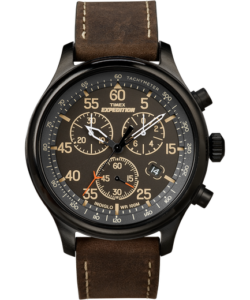 This Expedition Field Watch is marketed for the outdoors, but still looks good enough to wear to work. Its waterproof level reaches up to 100 meters. While it’s a good watch overall, it’s the band that has us worried. While a watch like this may survive a few accidental splashes of water, its leather strap isn’t suitable for, say, a dip in the pool or a day on the beach. The model has a very stylish and versatile design. Features include an Indiglo light-up watch dial for easier reading in the dark. The model features a chronograph measuring 1/20th of a second. Genuine leather straps not appropriate for being submerged in water. Only comes in two similar designs. 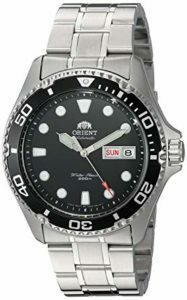 Orient is another affordable but high-quality brand, and its Ray II is made entirely of stainless steel. Based on its given specifications, it’s an extremely sturdy choice. Its blue on silver or black on black color options make it look very stylish, but that doesn’t mean it fails in terms of functionality: It has a water resistance of 200M and was built for improved precision. Its waterproofing level is good for your casual swimmer or water sports enthusiasts, but not for serious divers. Its style would also look good for everyday or formal purposes. Also, based on reviews, the calibration tends to go off after a while. The model features sturdy, high-quality materials made in Japan. It has a very stylish and versatile design good for everyday use. Calibration tends to go off after a while and will require maintenance. Nothing remarkable about the design that makes it stand out from other products on the market. Why are you looking for a new watch? Are you trying to replace your current watch that you’ve already worn out, buying a gift for a friend, or just looking for another watch with a versatile design and multipurpose features? Whatever the case, I strongly recommend getting a watch with waterproof features. Water-resistant watches were made with style, function, and durability in mind. Made for divers and swimmers, these watches were designed to withstand the wear and tear experienced in both dry and wet environments. It is much better to invest in a durable watch that will last you a long time than a watch that will most likely break down easy. Save your money by keeping water-resistance as a factor to consider when browsing for men’s watches. If not these watches we’ve listed, consider the brands we’ve mentioned. These range between high-end to mid-range brands that offer high-quality products worth the cost. It’s a much better option than having to buy plenty of low-end watches that, although cost less on its own, accumulate on costs each time you buy a new one.